On November 13-16, 2017, the ADIPEC 2017 was held at the Abu Dhabi National Exhibition Centre (ADNEC) as scheduled. 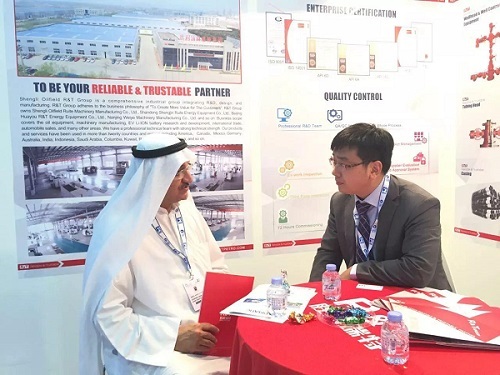 As the largest oil and gas exhibition in the Middle East and even Asia and Africa, the exhibition gathered the leaders of the global oil and gas industry to communicate and cooperate with each other. R&T Group that aims at "To Be Your Reliable & Trustable Partner", attended the exhibition with API 6A wellhead equipment, API 6D pipeline valve, API 16C high pressure, throttling manifold and other products. More than 100 global merchants came to visit and negotiate in the first day. As the integrator of global resources, R&T Group has always attached primary importance to the needs of customers. It provides customized solutions according to the requirements of customers in different regions. Relying on years of experience in oil equipment research and development, it strives to provide the best products and services for every customer, and create more value for customers! During the four days of the 20th Abu Dhabi International Petroleum Exhibition and Conference, R&T Group will fully display the group's upscale products and technical services in the field of petroleum equipment. With innovative integrated solutions, it will confront the complex challenges of oil and gas market together with global customers.